1) Be introduced to key concepts of community benefit (for healthcare institutions), community wealth building, and anchor institutions and learn how they connect. 2) Hear examples from hospitals and community coalitions that have recognized the importance of community economic development and how it can benefit the communities they are located in. 3) Understand potential activities between anchor institutions (especially non-profit hospitals) and community-based organizations/coalitions using community benefit that can be conducted in participant communities/regions. Webinar slides (PDF): Slides from the December 4, 2013 webinar presentation. Key community benefit terms: As nonprofit hospitals begin to comply with a new federal requirement that they partner with community and public health representatives to identify and develop strategies for addressing community health needs, this one-pager provides helpful definitions for important terms to know. "Going outside hospital walls to improve health:" An op-ed in The Baltimore Sun by David Zuckerman & Gar Alperovitz on community health needs assessment and community economic development. "Why Eds and Meds Matter for Community Economic Development:" An op-ed in Rooflines: The Shelterforce Blog by Steve Dubb, Research Director at the Democracy Collaborative, in response to Richard Florida's recent article in Atlantic Cities. Building Community Voice and Power, One Hospital at a Time: IRS Proposed Rules Encourage Hospitals to Address Disparities in Health and Financial Barriers to Care: This Community Catalyst blog outlines the organization’s comments to IRS proposed rules for how non-profit hospitals engage community and public health partners in their community benefit planning (available 12/9/13). Hospitals Building Healthier Communities: This Democracy Collaborative report provides an in-depth look at six hospitals in five cities that are rethinking their economic and community engagement strategies. These hospitals have recognized that health is more than just treating the patients that come through their doors and are beginning to adopt an “anchor mission” that can help build not only more prosperous, but also healthier communities. Pages 19 to 24 examine the new community benefit provision and the opportunities it creates. Protecting Consumers, Encouraging Community Dialogue: Reform’s New Requirements for Non-profit Hospitals: This Community Catalyst factsheet provides an overview of the Affordable Care Act’s new requirements for non-profit hospitals, including developing written financial assistance policies, limiting charging, observing fair billing and debt collection practices and conducting regular community health needs assessments (CHNAs). This Democracy Collaborative report proposes a set of indicators to help institutions reflect and assess broadly the long-term impact of their anchor-mission activities, and particularly their impact on low-income communities. 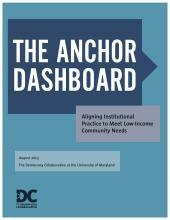 Developed through extensive research and in-depth interviews conducted with more than 75 leaders of anchor institutions, national nonprofit organizations, federal agencies, and community organizations, the Dashboard identifies twelve critical areas where anchor institutions can play an effective role.